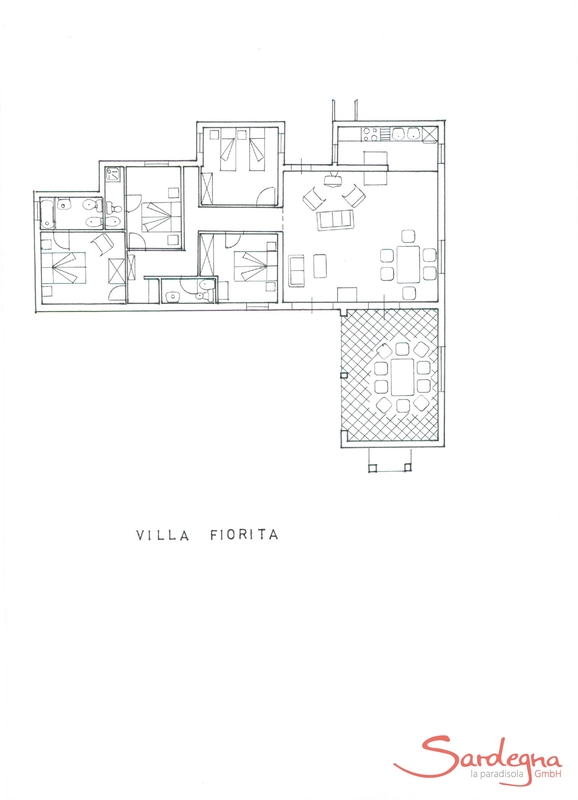 Villa Fiorita is surrounded by evergreen macchia shrubbery and pine forests. 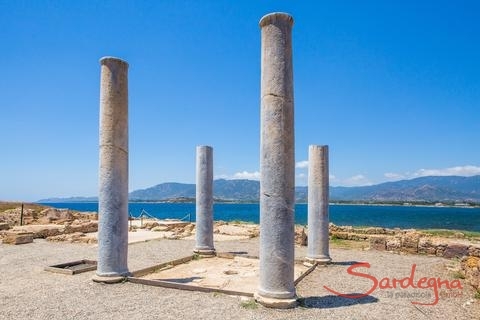 Nestled in a blooming Mediterranean garden of palm trees and cactus fruits, the villa is situated near <?xml:namespace prefix = st1 ns = "urn:schemas-microsoft-com:office:smarttags" />Pula and has a fantastic view of the ocean and its neighboring mountains. 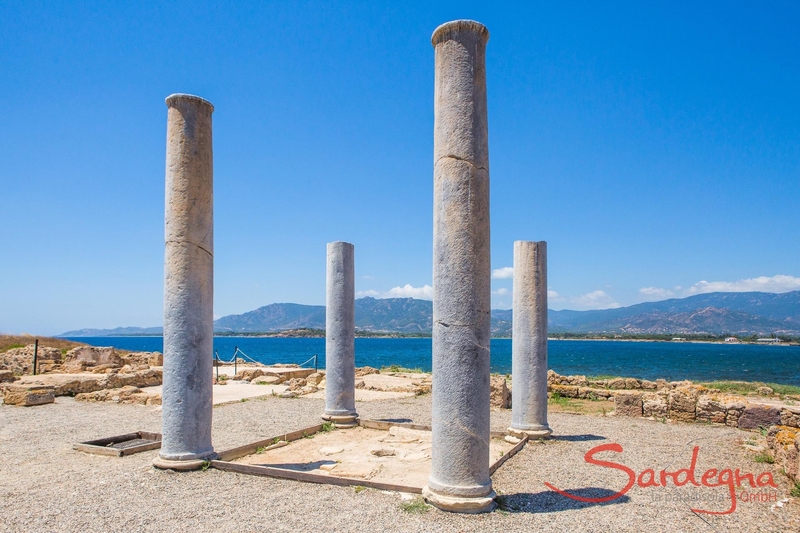 In the distance, you can see the gleaming tower of the ancient Roman town, Nora and its amphitheatre, directly overlooking the ocean. A covered terrace provides guests with the opportunity to experience the one of a kind character of a Mediterranean estate. A beautiful pool, embedded in rock, is available exclusively to the guests of the villa. Because of its spacious capacity, generous terraces and bountiful open seating, the Villa Fiorita is perfect for holidays with large families or groups of friends. Visiting couples will also feel relaxed and comfortable in the villa’s cozy setting. 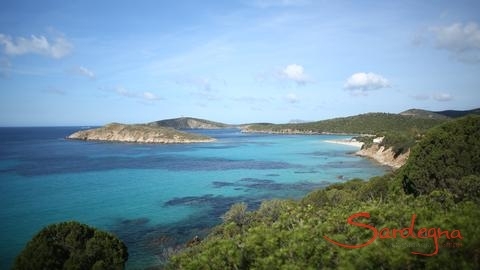 Villa Fiorita is an exclusive villa with four air-conditioned bedrooms, three bathrooms and a living room with a traditional Sardinian fireplace. 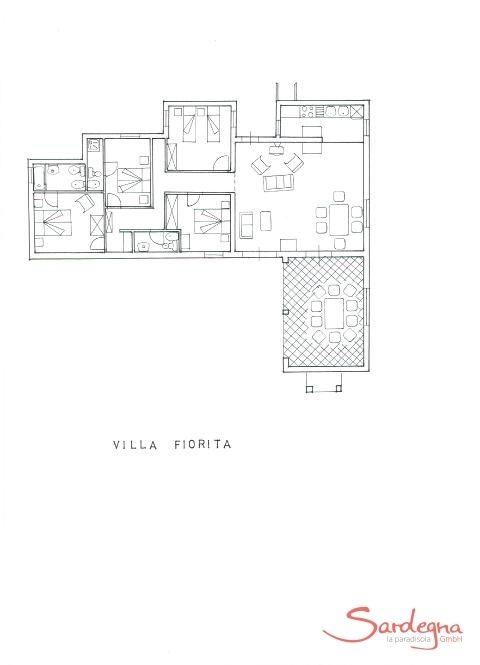 Equipped with a washing machine, a dish washer, an electric oven as well as a large refrigerator the villa’s kitchen can accommodate meal preparation for large groups. 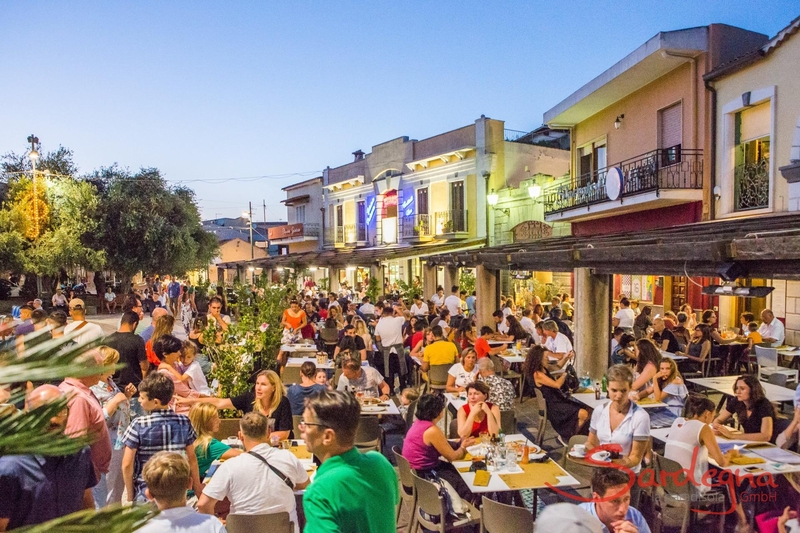 This lively village not only offers numerous shopping facilities, it also affords the opportunity to experience the daily life of a Sardinian town complete with markets and festivals on the Piazetta. The nearby beaches offer a plethora of sporting activities. The Is Molas golf course, one of the most beautiful in Europe, is only few minutes’ drive from the villa, making this location especially attractive to the avid golfer. Archeological site of Nora and spanish tower of Sant Efisio, 13 km. Roman columns in the archeological site of Nora, 13 km. Stunning vacation home with a pool and a viewVilla Fiorita is surrounded by evergreen macchia shrubbery and pine forests. Nestled in a blooming Mediterranean garden of palm trees and cactus fruits, the villa is situated near Pula and has a fantastic view of the ocean and its neighboring mountains. 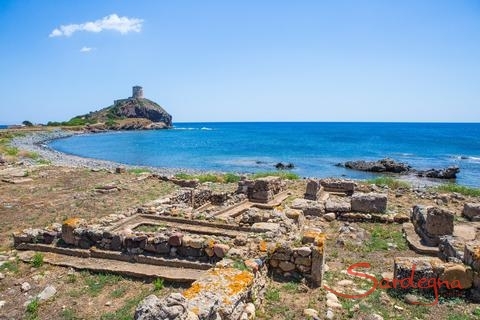 In the distance, you can see the gleaming tower of the ancient Roman town, Nora and its amphitheatre, directly overlooking the ocean. A holiday with family and friendsA covered terrace provides guests with the opportunity to experience the one of a kind character of a Mediterranean estate. A beautiful pool, embedded in rock, is available exclusively to the guests of the villa.Because of its spacious capacity, generous terraces and bountiful open seating, the Villa Fiorita is perfect for holidays with large families or groups of friends. Visiting couples will also feel relaxed and comfortable in the villa’s cozy setting. 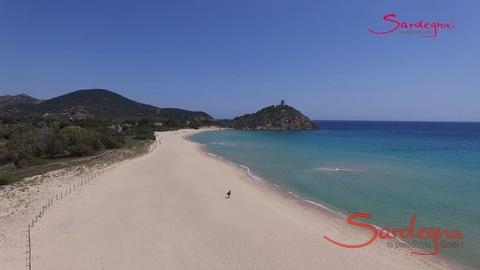 Villa Fiorita is an exclusive villa with four air-conditioned bedrooms, three bathrooms and a living room with a traditional Sardinian fireplace. Equipped with a washing machine, a dish washer, an electric oven as well as a large refrigerator the villa’s kitchen can accommodate meal preparation for large groups.Only a few kilometers from Pula This lively village not only offers numerous shopping facilities, it also affords the opportunity to experience the daily life of a Sardinian town complete with markets and festivals on the Piazetta. 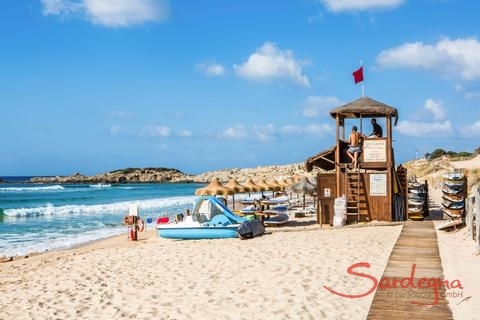 The nearby beaches offer a plethora of sporting activities. The Is Molas golf course, one of the most beautiful in Europe, is only few minutes’ drive from the villa, making this location especially attractive to the avid golfer. Villa Is Molas Monte combines luxury with traditional charm: the exclusive mansion is situated on a hill between fragrant pine trees and wild scrub. The huge pool surrounded by rocks oozes Mediterranean flair; the terrace offers a magnificent view of the sea near Pula. Book now! Villa del Sole is a unique holiday home: the lovingly decorated country house sits enthroned on a hill surrounded by 10 hectares of pine forest and flowering gardens. 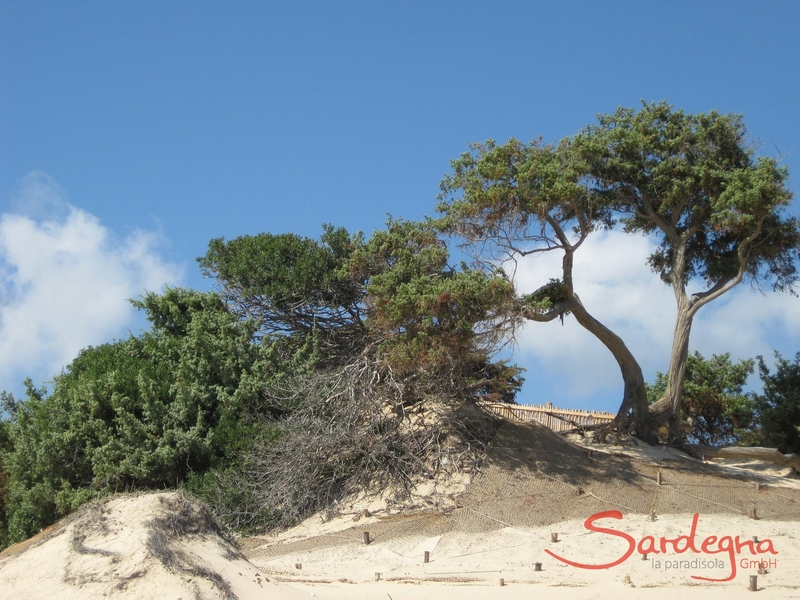 Here you can feel all the charm of Sardinia. An exclusive pool and a magnificent view complete the experience. Book now! 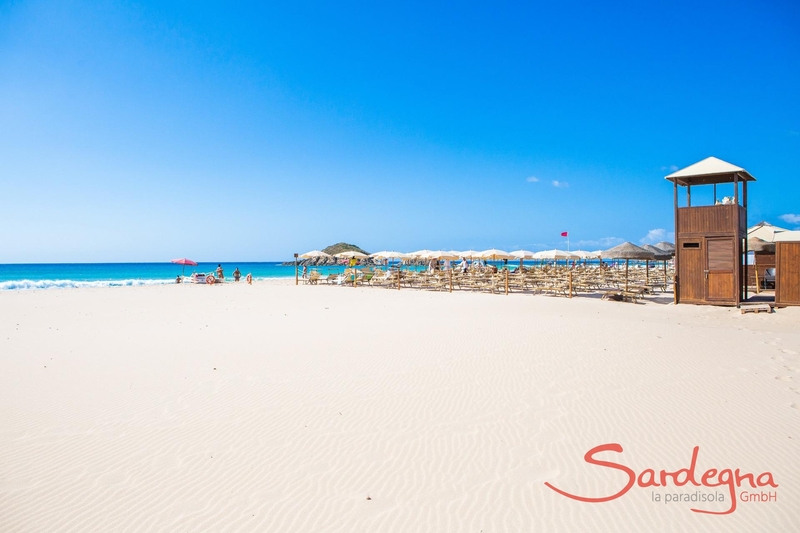 Villa Le Poiane Sardinia shows its authentic side: the stylishly designed property's Mediterranean charm is enchanting and boasts spacious terraces with panoramic views and a private pool. For your wellbeing: the silence and the view over the sea and the Pula plain. Book now! Villa Su Tauloni is a modern holiday dream: The luxurious, spacious villa at Is Molas is surrounded by pine trees, palm trees and a large garden. From the terraces you have a magnificent sea view, the infinity pool is embedded in a group of rocks. Treat yourself to something special! Stunning scenery and architecture in a beautiful setting. Sardinian deer live in the woods around Villa Fiori. Sometimes at night the deer decide to dine in the gardens of Villa Fiori, making a meal of hibiscus, fruit trees, and flowers. It's not unusual to encounter deer and pheasant on your way back to the house. Villa Dorada is a green retreat in a class of its own: the magnificent villa sits on a hill - its many retreat possibilities and spacious terraces with panoramic sea views are captivating. The exclusive pool is framed by pine and macchia. Book now and enjoy Sardinia!